Meet the Sports Activity Vehicle designed specifically for drivers who want to embrace life. Featuring beautiful yet rugged external styling, a spacious and refined interior, plus the capability to take all kinds of journeys in its stride, the X1 is in many ways the perfect family vehicle. 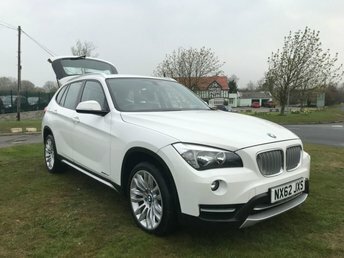 You can take a closer look at the range of used BMW X1 cars for sale in Darlington right now by paying a visit to Martin Bell Car Sales. Alternatively, take the opportunity to browse our complete stock of used cars here on the website before getting in touch with a member of the team for more details. Call, get in touch online or pay us a visit in person. Finance is available to UK residents aged 18 years or older, subject to status. Terms & Conditions apply. Indemnities may be required. Other finance offers may be available but cannot be used in conjunction with this offer. We work with a number of carefully selected credit providers who may be able to offer you finance for your purchase, commission may be received. We are only able to offer finance products from these providers. Postal Address: Martin Bell Car Sales, The Sun Garage, Wackerfield, Darlington, County Durham DL2 3AS. Find contact details here.